I am currently doing G*E interaction with SES as a moderator. The plot (attached here) suggests that SES likely moderates with the A factor. To analyze whether the moderation effect is significant on A factor, I drop the moderator on the Path A only and compare the model fit (diffLL). I find that the p value is insignificant. I want to ask whether this is the correct way to see the significance of moderator effect. Also, is it appropriate to see the unstandardized variance components by SES moderation, rather than the standardized variance components? The plot can be misleading: if the moderator on the Path A doesn't improve fit significantly, then that tells us the plot apparently sloping around reflected the parameter being estimated at a non-zero value, but including other values including zero in its CI. 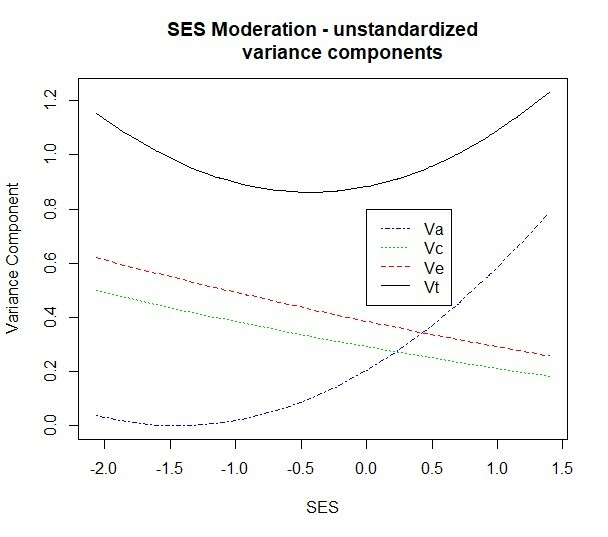 Not sure what you mean by is it appropriate to see the unstandardized variance components by SES moderation. it's often very informative. umxGxE does this model and the plots for you. Also umxReduce() will reduce the model in ways that typically make sense for a table in a journal. Many thanks for the reply! In another example that the slope in the plot is not so obvious (aMLL value is smaller) but exactly linear, the Δ-2LL is significant. Therefore, I wonder whether linear moderator effect is be more easily recognized and quadratic moderator effect is more likely be recognized as insignificant by comparing model fit? The moderation is a linear effect in path coefficient terms, and the effect on variance is squared, hence the common curvature. (PS: umxGxE also includes quadratic effects on means).